Filing for Chapter 13 bankruptcy in Phoenix, Tucson, Mesa, and throughout Arizona allows you to reorganize debt through a court-authorized repayment plan. An Arizona Chapter 13 bankruptcy filing will help to structure a debt repayment plan that you can afford. Filing for a Chapter 13 bankruptcy in Mesa, Glendale, Phoenix, and Tucson, Arizona means all harassment from bill collectors must stop. A Chapter 13 bankruptcy will prevent the foreclosure of your home and/or the repossession of your property. 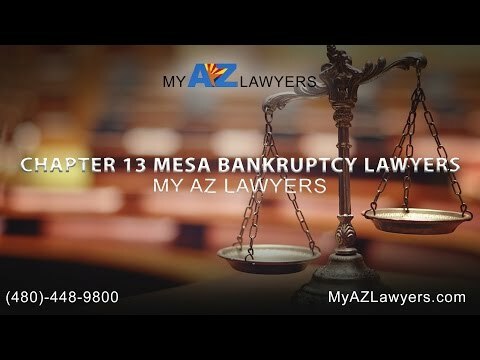 At the My AZ Lawyers, your regional bankruptcy attorney in Arizona, will have the knowledge and the experience to take all necessary steps to help you with a Chapter 13 bankruptcy. An Arizona bankruptcy lawyer and bankruptcy attorney will be by your side every step of the way making your bankruptcy experience easier. Our knowledgeable bankruptcy attorneys and lawyers on staff will work closely with you to get you through this difficult time. Contact us to set up a free initial consultation with a Glendale, Mesa, Phoenix, Tucson, or other regional Arizona bankruptcy lawyers and bankruptcy attorneys. Find out if you qualify for a Chapter 13 bankruptcy and let our debt specialists help you determine if Chapter 13 bankruptcy may be the debt relief solution that you are looking for. If declaring bankruptcy is not the answer that you are looking, our experienced staff at the My AZ Lawyers will advise you to other potential debt relief solutions. One of these other possible solutions and another way to eliminate debt is through consolidation of your debts. Our debt consolidation attorneys and lawyers will help you determine if a consolidation of your debts is perhaps a better financial road for you and your family. Debt consolidation is getting a single loan to replace many unsecured debts, such as credit card balances. If you have a number of credit cards, you will no longer need to make numerous payments each month. Instead, all of your debts will be combined into one, for a single monthly payment. Debt consolidation loans are designed to help consumers eliminate debt. These loan products, offered by financial institutions, Phoenix bankruptcy lawyers, and specialized lenders, let you clear debts to multiple creditors and escape the phone calls, letters and hassles that indebted people face month after month. For more information Contact a Glendale, Tucson, Mesa, and Phoenix bankruptcy attorney today. Our experienced bankruptcy attorneys, debt specialists, and bankruptcy lawyers financial advice will help you determine the best solution to your current financial situation. Budgeting your money is easier with one monthly payment, replacing the numerous debt payments you have now. It helps to eliminate late payment fees as you have only one payment to make. With a single monthly payment, it is easier to remember when your payment is due each month which reduces late payment fees. Debt consolidation loans generally have lower interest rates than the rates you are paying on credit cards and other high interest rate debts. That means more of your monthly payment goes toward the principle of your debt. Repaying all of your debts in full with a debt consolidation loan leaves you with, in most cases, a perfect credit report.